Having just recently decided to embrace a vegetarian lifestyle, I knew there would be some foods that I would miss on this new adventure. 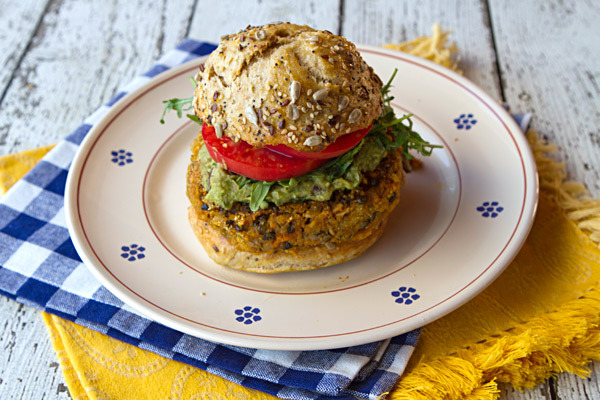 A good juicy turkey burger is certainly one of my “once in a while enjoyments” that I will be giving up, so I decided to spend some effort looking for a great tasting veggie burger. 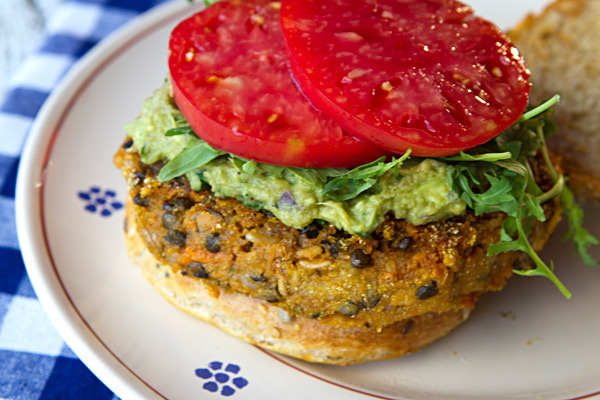 My first attempt is this sweet potato lentil burger that I served on my homemade whole grain buns with guacamole, arugula, and tomato slices. While these burgers were really very tasty, I think I would prefer them served on their own with a dollop of a spicy sauce such as chipotle aioli rather than served in a bun. Although my husband and I both really enjoyed the flavor of these burgers, for some reason they did not hold up to being eaten by hand in a bun and fell apart as we ate them. I would certainly make these burgers again, but I believe that I would prefer to serve them on their own with a sauce, or fresh fruit salsa. I also think they would be great served in lettuce leaves with some chopped avocado and perhaps freshly made salsa. Sweet potatoes are not commonly found here in Italy so when I discovered them recently at a local grocery store I bought every potato that they had! We love sweet potatoes and they really are very versatile, particularly in a vegetarian kitchen. 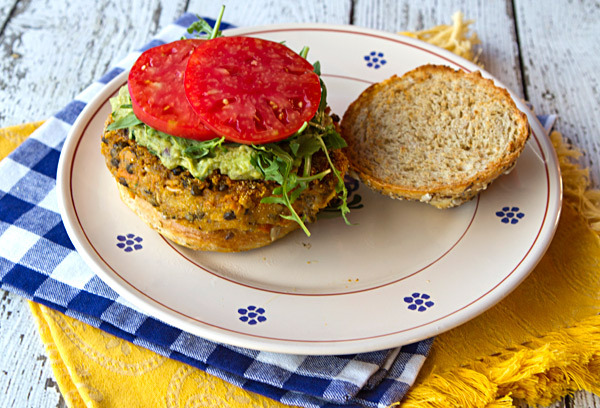 I love the combination of the sweetness of these potato and the fiery spices in these burgers, but if you are serving these to kids you may want to decrease the spices somewhat. Line a large baking sheet with foil, and toss the sweet potatoes with the oil. Spread the potatoes onto the baking sheet and bake until fork tender, about 20 minutes. Once cooled, place the potatoes, quinoa, lentils, oats, onion, cumin, chili powder, chipotle chili, salt, pepper, and egg in a bowl. Use a potato masher to mix really well. Refrigerate mixture for 1 to 2 hours. Shape the mixture into 8 patties and refrigerate until needed. When ready to cook, heat 2 tablespoons of olive oil in a heavy skillet over medium heat. Place three to four patties into the hot pan, and cook until lightly browned on both sides, and heated through, about 3 to 4 minutes per side. Remove these burgers to a heated plate and cover. Continue to cook the remaining burgers adding additional oil as needed. Serve the burgers as desired.